Hot humid weather has lasted. I've got tired because of the summer heat. Many people have been rushed to hospitals with heat stroke. September 12th corresponds to the 15th day of the 8th month in the lunar calendar this year. 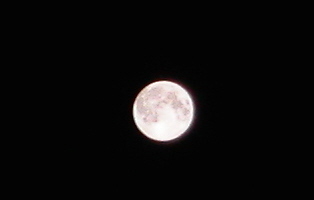 Moon Viewing is held on this day. It derives from the Chinese Mid-Autumn Festival. We see a rabbit pounding steamed rice on the moon surface. It's like a rakugo storyteller who kneels on a cushion with a folding fan in its hand. There is a custom called Tsukimi-dorobo(月見泥棒) like Trick-or-treating on Halloween in some areas. The moon on this day is also called Imo-meigetsu (芋名月). Imo refers to tubers. Moon viewing is thought to have been also a celebration for the first taro harvest. On this day, people used to be allowed to eat taros out in their neighbors' fields in many areas. But there was a limit to the amount of them. In some areas, children used to be allowed to sneak rice dumplings out of the neighbors' houses. But the dumpling was limited to one per child. It was a thrill-seeking behavior for children. Adults considered that the moon ate the dumplings. The community as a whole watched children grow up. In another areas, they visit their neighbors and ask for sweets, saying "Give me Otsukimi(sweets)!" They say "Thank you" when leaving. Recently, people leave a basket of sweets around the entrance. Some children don't give thanks to them, take all of sweets, make a scene when seeing empty basket and come from different towns. For some children, it's only an oppotunity to get sweets for free. This accessible waka poem is included in "one hundred waka poems," a famous poetry anthology selected by Fujiwarano Teika in the Heian period. "The harvest moon, while pacing around the pond, I saw the dawn break," written by Matsuo Basho(松尾芭蕉) on the 15th day of the 8th month in the lunar calendar(corresponding to October 2nd in the Gregorian calendar) in 1686. He held a Moon-viewing party with haiku poets at his hermitage in Fukagawa, Tokyo. They enjoyed the harvest moon on a boat in the Sumida River. He moved to Fukagawa and became a monk in 1680. Besides composing haiku poems, he got coaching from a Zen monk. "At the same inn, a prostitute also stays, bush clover and the moon," written by Matsuo Basho at an inn in Niigata on the 12th day of the 7th month in the lunar calendar(corresponding to August 26th in the Gregorian calendar) in 1689. Basho wearing monk's stole and a colorful prostitute stay at the same inn. In its yard, bush clovers are blooming beautifully in the moonlight. A combination of bush clovers and the moon is something akin to that of monk and prostitute.